It is strangely reassuring how often it is the simplest things that are most pleasurable. All it was was choice-cut slivers of meat, fresh vegetables, a pot of boiling water seasoned only with cloves of garlic, and two spectacularly distinct yet complimentary dips, one the rice-vinegar and mirin-based ponzu, and the other, a thicker sesame cream. Enter shabu-shabu (traditional home-style Japanese hotpot). 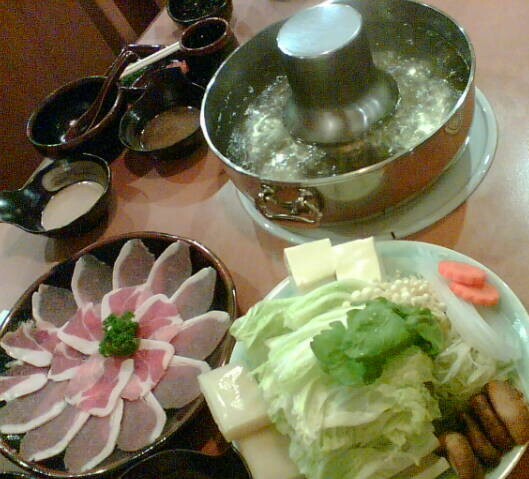 Typically, shabu-shabu is served with beef, although Ohsumi's renown is more for pork. We pigged out on the pork shoulder (lean but more chewy) and loin (more fat, but oh-so-tender). And when we were done with the meat and veggies, we were given a bowl of udon noodles to slurp down with the remaining soup. I can taste it even now. At an average S$30 (US$17) a set, this is really a good-deal meal.